You meet people in the oddest ways. Last year my friend Guy Campo mentioned playing with a guy named Buddy Cash (these are actual names, a guy named Guy and a buddy named Buddy). There aren’t many people out there with my last name, so I initiated a conversation on FaceBook with Buddy, who turns out to be an incredibly talented musician and genuinely nice human being. 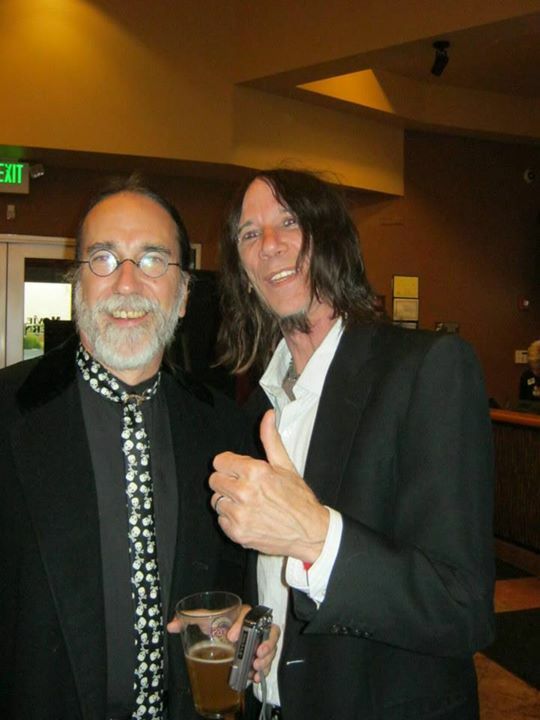 We met in person at the premiere of a film featuring Buddy (with Guy as well), and found we had many mutual ideas about life. This is when I cut my beard, someone had noticed a picture of Buddy and I and asked if I was his father, when in fact Buddy is a few years older than I.
I haven’t had the opportunity to see Buddy play live, that is I haven’t had the time, Buddy plays five or six nights a week at various venues with various lineups. 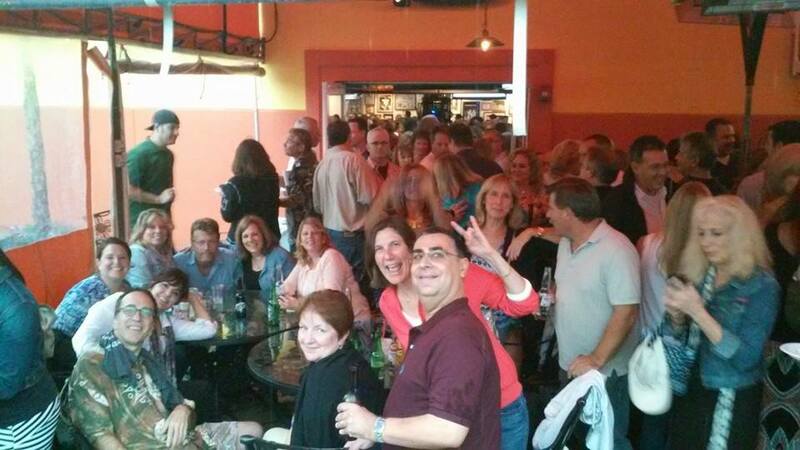 Last night I drove down to Wilmington Delaware to catch his Monday night gig at Gallucio’s with a couple of friends. This gig is called “Open Mike Night,” which turns out to be all requests and the opportunity to get on stage and sing lead vocals in some cases. It was amazing. Not only could the band play anything requested, they played it well enough to be mistaken for the original artists. I don’t mean they sounded like the album version of the song, they had the feel of the artists. When they played a few Led Zeppelin songs, Buddy and Jim sounded like Jonesy and Bonzo. When they played “Something,” Buddy’s bass line sounded more like George Harrison playing bass than Paul McCartney, he totally captured the feel and intent of the music. The range of songs played would probably be mind numbing to most people. I’m not good at categorizing music, and when people have asked what kind of music Buddy performs I usually say “good.” That word doesn’t fit now that I’ve seen him play, and superlatives are usually dismissed, so I’ll say “Come along and hear for yourself.” I can see myself at Gallucio’s most every Monday night from now on, and Buddy has asked me to see him at Tom and Jerry’s in Milmont Park Pennsylvania a couple of times because he lives nearby and we could hang out at his place with his family and pets (he has five cats and a pig) after the show. I’ll have to to take a Saturday off for that one, the gig is on Friday and I don’t expect to be wide awake at 0500 the next morning. Emma had once been a waitress at Tom and Jerry’s, so there are a couple of reasons the gig is attractive to me. 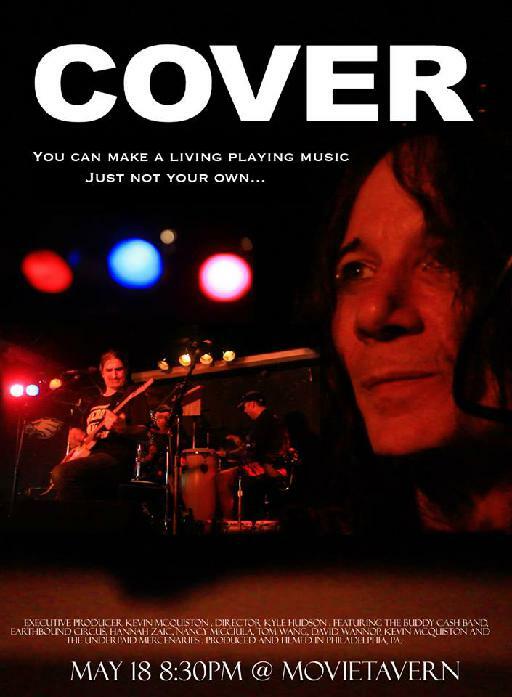 COVER’s producer, Kevin McQuiston, has made the film available online for $2.99, I can’t get the link he provided to work for me, but here it is. I’ll need to contact Kevin soon, because I seem to have given away all my copies of the DVDs he was selling at the premiere. When I hear from him I’ll update that link. One more from last night, if you see me at one of the gigs come over and say hello. But this article is not about George Harrison or Leon Russell, maybe a little bit about Bangladesh, but not in a direct way. Today I write about Maya, as I do most of the time. The veneer which many accept as reality. Our National leaders are a measure of the consensus of gullibility. When Obama was elected his charisma was palpable. For those of us who have experienced cult behavior, the parallels of his blind followers and the Jonestown Massacre were frightening. As the years passed, most intelligent people have been able to see him for what he is, a deluded puppet with no understanding of politics, leadership, or the Constitution of the United States. Unfortunately, intelligent people are a minority. How he was re-elected at the point his approval rating was at an all-time low astounds me, and as polls show his increasing irrelevance (those who “strongly approve” of his performance decreasing while those who “strongly disapprove” rising) they also indicate the polarization he has reintroduced to American society. For some reason, the adage “Politicians lie” is accepted by an increasing number of people, the more disturbing subtext is the number of people who don’t care that politicians lie. Obama’s inability to accept the responsibilities of the office he holds has me fuming this morning. In two years and four months he’ll be gone, but it appears he intends to do as much damage as possible before he goes. A man who is so widely accepted by his followers as being incredibly intelligent has been able to use the “I didn’t know about that” defense for years. I take that as an indication that his followers are equally uninformed, as anyone with a passing familiarity of the subjects he has claimed ignorance about knew more than he claimed to know. One would assume that during his daily intelligence briefings he picked up more than golf tips. I guess that’s the down side of having followers who believe anything you say, being honest becomes unnecessary. In case you’ve been playing golf for the last couple of years, there is a group who call themselves “The Islamic State of Iraq and Syria,” abbreviated as ISIS, ISIL, IS, and also known as “those freaking bloodthirsty maniacs” by almost everyone else on the planet. When Al Qaeda calls a group “too extreme,” they might be worth tracking. Somehow, a retired intelligence analyst in Princeton NJ is more aware of their threat than the President of the United States. I am certain his sources are better than mine. A leader takes responsibility for his team. Six years into his term he is totally responsible for his advisers, yet he still blames failures on them instead of either admitting he wasn’t paying attention to them or he made poor choices in appointing them. I wish I could feel pity for this pathetic fool but right now all I feel is disgust. If you can’t trust your intelligence, try tuning into BBC, CBC, Al-Jazeera, or even your media pet CNN. How is it that the President of the United States is the only person on the planet that underestimated ISIS, and somehow that is the fault of his intel team? A friend had a saying when the Air Force was undergoing a “management overhaul,” in which officers were promoted based on their management skills. Carl would say “You don’t manage a man into battle, you lead.” Over the years the entire concept of “leadership” has devolved into “management.” I see it everywhere, but when the President stops being a leader and is just another manager, dodging responsibility and stealing the limelight from true achievers, the attitude spreads throughout society’s expectations of their leaders. It seems unlikely that our next President could be worse, but it is altogether possible considering what the American public will settle for. I was just Skyping with Lieve, and she mentioned an incident in which a two year old ate some mushrooms, and had to be rushed to Lieve’s father with an uneaten mushroom so he could identify the species. The baby had been left under the supervision of his five year old sister, who was being berated for not watching the baby closely enough. If you think it is appropriate to make a five year old a babysitter, is it really the babysitter’s fault if something goes wrong? Responsibility lies upon the top authority figure, in this case the Father, he made a foolish choice entrusting his baby’s safety to another child. We, as citizens of the United States, are ultimately responsible for the performance of our elected officials. I didn’t choose Obama, but I accept my responsibility as a member of a democracy to accept his authority. I just wish my fellow Americans could accept their responsibilities in choosing a leader. The Autumnal Equinox is today, 22 September at 2229 EDT (23 September 0229 UDT) . I try to note the passing of the seasons, not with the sadness for the season that has passed, but with the anticipation of the wonders of the new season, knowing the last season will be back in about nine months. The cooling of Autumn allows the trees to rest, turning beautiful colours and then losing their leaves, before the Winter snow weighs down those leaves and takes down the trees. The Winter snow is a reservoir, moisture slowly melting into the ground to feed the growth of Spring. Spring brings new life, lush green vistas, fading into the heat of Summer, outdoor activities, long evenings with the crickets, and then again the colours of Autumn. I’ve had two cats named Autumn, the first because he was born on the Equinox, the second because Emma thought she looked like a pile of leaves. I can’t say I have a favorite season, but the slowing of pace and gentle earth tones allow introspection, this for me is the ending of the year, a time to reflect on the past year. The season lends itself to melancholy, the fading vibrance of summer colours and appearance of the reds and browns feels like death to some, when it’s really just the adorning of bed clothes. Back to school often means an end to Summer romances, later we learn that romance can be mortally wounded at any time. I’ve certainly had my share of joy and terror this year. Life does not last forever, nothing does. Our lives continue beyond our days as the influences we have had on others, I believe our love lasts far longer than we do. On the other hand, several people have said I am a hopeless romantic. The changing seasons teach patience and faith. The Earth will continue around the Sun, shining either more or less on our hemisphere on a regular cycle. The days grow shorter, then they grow longer, then shorter again. Over and over. Each year we long for Summer in the snows of Winter, and long for Winter in the blazing heat of Summer. We could not have one without the other, the wise among us learn to respect each for its unique charms. My work will occupy a great deal of time this Autumn, but one good part is my days off are weekdays, and getting up at 0500 becomes a habit. There will be walks, with mist on the waters, deer and heron, and no people as they scurry off to work. I will be considering the past and its lessons, and planning a future built on the changes. Not that many of my plans go as designed. I will be exercising faith, and hopes, and a few dreams. We can all be crushed by circumstances beyond our control, rising above our personal pain is what makes us good people. If you have never been tested, you are only potentially a good (or bad) person. One person who is currently being tested is Dan Scimeca, retired Chief of Police from Manasquan New Jersey, and husband of a High School friend of mine, Colleen (Walker) Scimeca. Not that he has not had other tests in life, and proven himself thoroughly, but as “Q” says to Captain Picard in the final episode of Star Trek; The Next Generation, the trial never ends. Colleen has worked for years raising funds for ALS, being involved with the Valentine Plunge each year. In an amazing twist of irony, Dan was diagnosed with ALS earlier this year. They are both weathering this storm with grace. Yesterday was a day of that rare event, Karma making itself obvious. Over eight hundred of Colleen and Dan’s friends gathered to raise funds for Dan and others who have ALS, packing Leggetts Sand Bar for “A Day for Danny.” It was quite amazing, the building was overflowing, and despite the great music from Ronnie and The Engineers, far too crowded to dance, or even move through the room. A small group of Colleen’s High School friends managed to stake claim to a table outside, driving in from as far away as Iowa. That’s me in the lower left corner. Yes, we had fun, we always do. We are also comfortable supporting friends in need, there is a charitable streak that runs through this group, championed by Tim Sickel (who is not pictured because he took the above photograph). I don’t know what the final tally for funds raised is, a low estimate would be $40,000, a drop in the bucket when it comes to the special needs of a family dealing with ALS. The love shared is immeasurable, just a wonderful thing to witness. Your financial situation has nothing to do with your charitable contributions. You may not have money to share, but you have a heart to love others with. If all you can do is smile then do that. Helping a stranger find something in the grocery store doesn’t cost anything, kind words are free, why not share them? We are all human, we have more in common with each other than we have differences. We are family, lifting up a fallen brother will never cause you to fall. I took Lieve to the airport, helped her with her baggage and watched her pass through security. I drove home to an empty house, what was supposed to be our home, as she flew to what was supposed to be our new home. She takes with her my heart, what was left of it after Emma died and she nursed me back to health. As I pulled in the drive, the neighbors were on their way out and met me, the cats had become a problem, attacking one of theirs, so we’re trying to figure out what to do. Just a little more added stress. I had looked forward to moving to Belgium, I had made friends there and was liked by her family. But she needs some space, and the only way I could show my love was to let her go. Letting go is about faith, I have faith that when she finds peace, she will remember our love, and rejoin our marriage. She leaves behind more than just me, she had made friends in America, and has two cats which I now look after. She leaves her beloved hummingbirds, “Colibri” in Flemish. I will always remember her excitement when she saw the first one, losing English and just shouting “Colibri! Colibri!” with the most beautiful smile, the smile that makes her so memorable to strangers. At the shore last year one man who we were helping didn’t recognize her until she smiled. 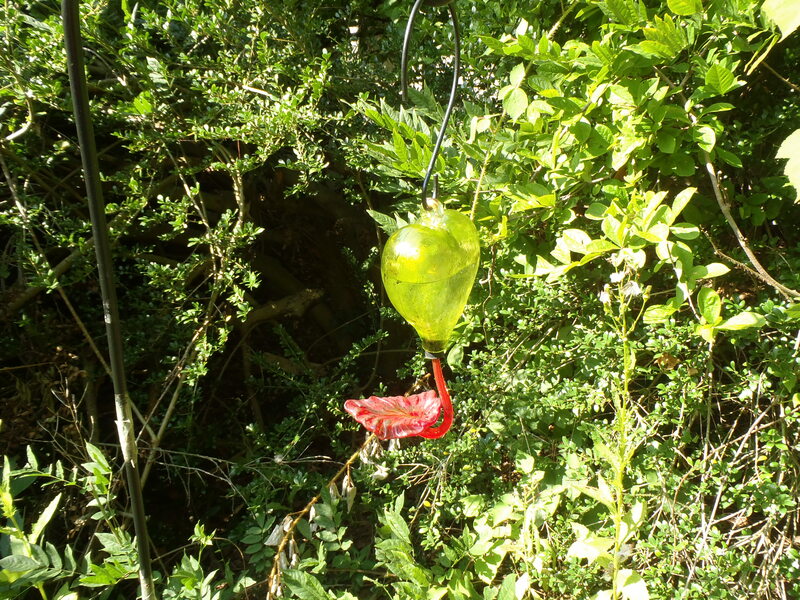 On her last birthday I gave her a custom blown glass hummingbird feeder, a heart with a red leaf, which she left behind, no hummingbirds in Belgium. She took the hummingbird ornaments and earrings I gave her, perhaps they will carry some happy memories. 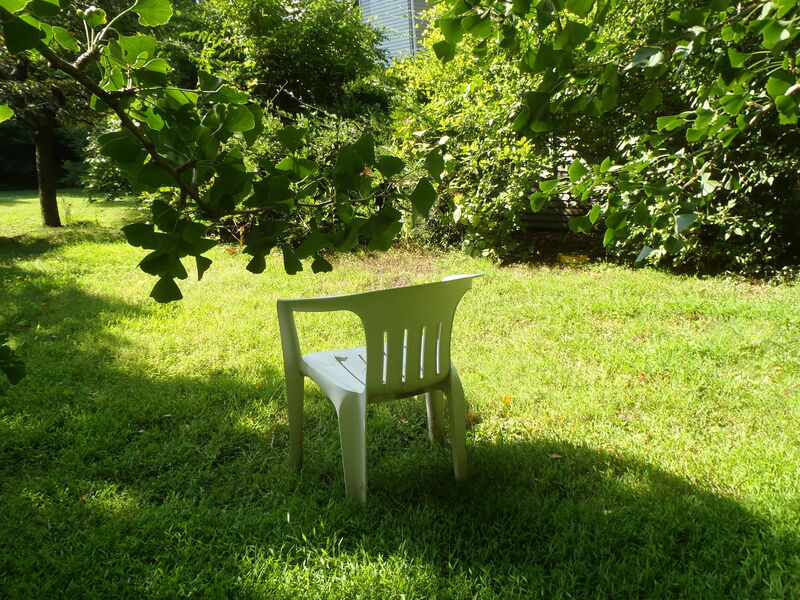 Now there is just the empty chair she would sit in to take pictures of the Colibri, who still come around. 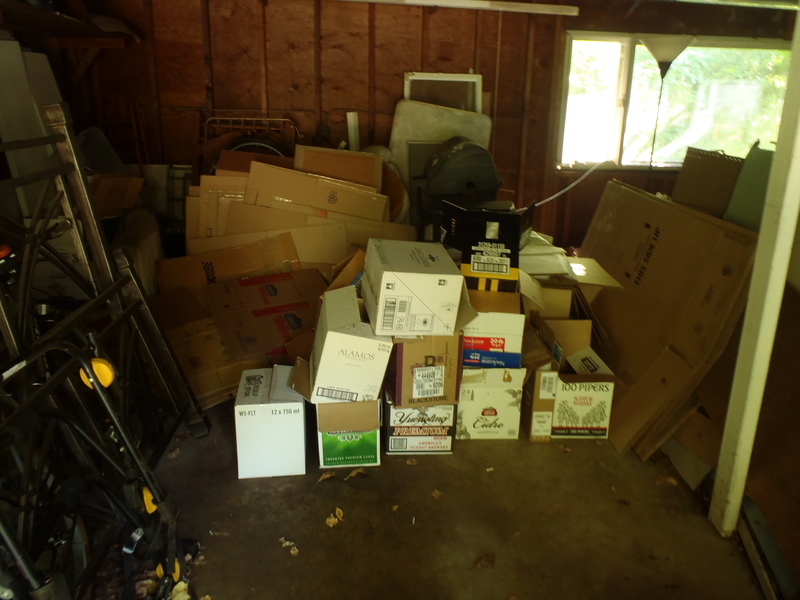 She left a garage full of empty cardboard boxes, the ones we were going to pack when I moved to Belgium with her. I try to sleep in our empty bed, she’s not here, and I’m not really here either. 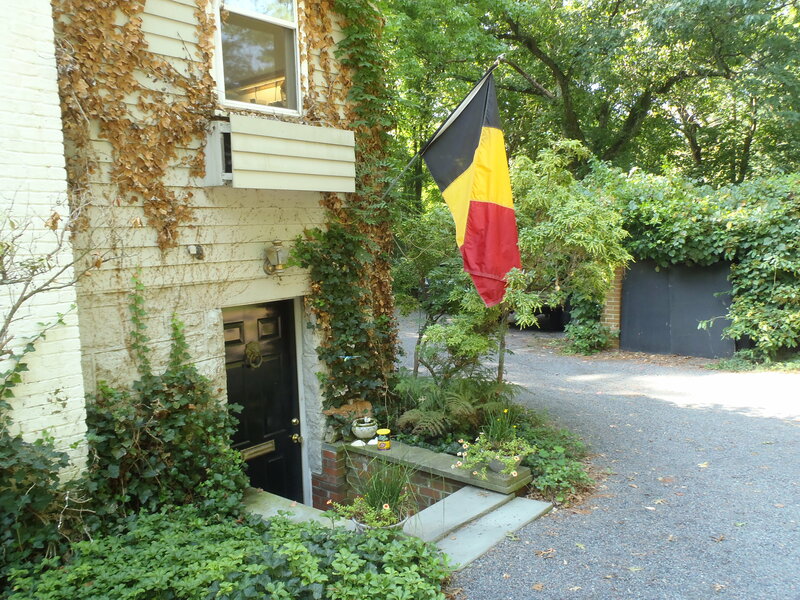 Today I’ll probably take down the Belgian flag I flew outside the door, I’ll put up my pirate flag and try to find my inner pirate. I used to take the month of November as a vacation from society, a month to reflect on the year, looks as if that vacation has been moved and extended. I do have plans to see friends, but it will be strange without my wife. Her beautiful antique map of Belgian railways is still hanging in the living room, as are the concert posters and other traces of her. I’ll make the bedroom “mine”, putting my clothes away in her dresser, arranging the room that is now empty. I’ll set up her keyboard, I’ve tuned my bass, and I’m planning to fill part of the void with music. I never really cared for audiences, now I can play for myself. In this vacant space I hope to find time to write about something other than the vacant space. Right now that’s all I have, the emptiness. I get home too late to watch the news, I catch the BBC once in a while, I’m aware that no one can decide what to call the terrorist group that is over running Iraq, one commentator referred to them as “Terrorists”, “ISIS”, “ISIL”, and “IS” all in one statement. That might make a good article. I haven’t even had time to read my friends’ articles, so I stuff my weekend with catching up from the week. Next week I’ll spend a day of the weekend working overtime, better to start while it’s still voluntary, maybe that will put off the inevitable move to mandatory overtime. Any news about the Ukraine is speculation or propaganda so I can wait a bit on that story. Putin should be wise enough to stall any major escalation until Winter, using the weather as a weapon just like Alexander and Stalin did. My new roommate should provide some interesting insights , he’s a Ph.D. candidate in Anthropology from Iran, a very pleasant young man who I rarely see. Most of the time I will simply be patient. Without devoting my life to the pain of being abandoned, maintaining my hope that Lieve will find her way back to us. It may take months, maybe a year, but part of marriage is having faith in your spouse. My first two marriages I failed, I learned my lessons and went into this one with the dedication I shared with Emma. I won’t give up, but I can’t argue, she has to decide whether she wants to be committed to this marriage or not, all I can do is wait.